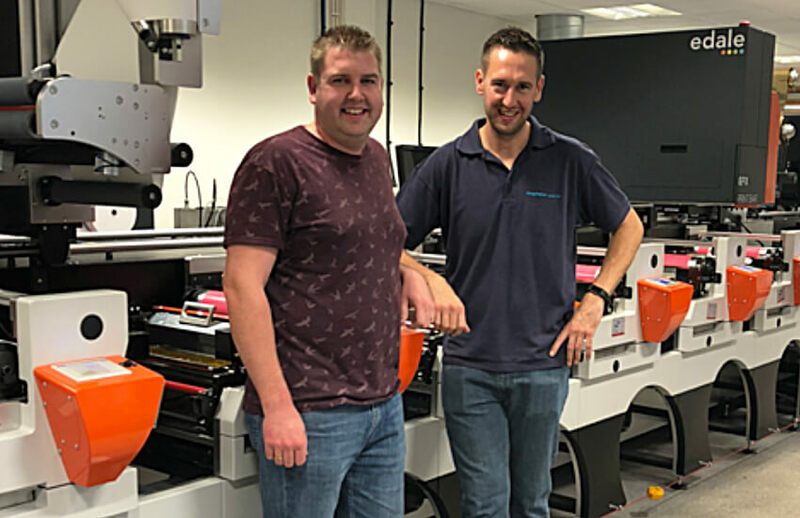 Kingfisher Labels UK based in Yate, North Bristol have recently purchased another Edale flexo-press taking their total number of Edale presses to 7! Edale have had a long-standing relationship with Kingfisher Labels since they installed their first Edale press in 2001. UK based and family owned Kingfisher Labels was established in 1996 and has risen to become a leader in servicing the self-adhesive label sector including Food, Cosmetic and Healthcare. The new installation is part of an ongoing investment strategy from Kingfisher Labels Ltd. The Edale FL3 is an 8 colour full UV 350 wide press with an array of rail mounted options including a turn bar, delam / relam, cold foil and lamination. The press also has chill rolls installed to give them the opportunity to diversify into new markets such as sleeves, wrap around labels, pouches and sachets. The Edale FL3 is due to be installed in November this year. (Image above) Left to Right – Karl Jackson, Production Director and Stephen Kerley, Production Supervisor, Kingfisher Labels.